What is the difference between corn flour and corn meal? I have a recipe that calls for a mix of corn and wheat flours, but my local grocery stores (in the south east US) only carry corn meal. Can I safely use corn meal in the place of corn flour? The corn flour is the white, finer ingredient on the right. The first obvious difference is that the texture will differ between the two. The second is that it would have different uses. Both would be effective at displacing gluten-containing flours (as in, neither would be helpful in gluten formation). In terms of substitution, however, corn meal is likelier substituted by something like semolina flour and corn flour is likelier better substituted by quinoa or garbanzo bean flour. Both are ground corn (maize, as they would have it in Europe). 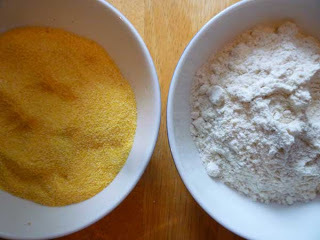 The difference is that corn flour is usually ground to a much finer texture than cornmeal. While in some contexts (such as breading chicken), they can both be used, you will get different textural results. In general, you want to use the right product. For example, corn muffins are normally made with corm meal, and if made with corn flour, would be much denser and without the mouthfeel the individual cornmeal granuals provide. Update: in some places, polenta is another term for corn meal (as well as for the porridge or mush made from the corn meal). Masa is dried lye-treated corn, which has been ground. It is used widely in southwestern, central, and south American cuisines, including for the iconic corn tortillas, and for tamales. Possible definitions are available in a recent publication of Annals of New York Academy of Sciences - look for table 4. Corn meal is listed as particle size from 300 to 600µm, with fat content of 1.8%, while corn flour is listed as particle size less than 212 µm, with fat content of 2.7%. They also mention various definitions in US CFR 137, which provide indirect particle size definitions in terms of how much of the product will pass through various types of sieves/cloth/gauze. In very simple words difference between Cornflour and Maize flour is Corn flour is the Starch part of Maize flour.. That means From Maize flour the starch and protein is separated and the fine smooth part is starch as itvis in Wheat flour when Starch and protein is separated...the starch part is called as Mayeda in Hindi and the protien part is called as Ravaa in Hindi. Not the answer you're looking for? Browse other questions tagged baking substitutions corn cornmeal or ask your own question. How do I eliminate Corn Meal “grittiness”? What can I use in place of Quinoa flour? What combination of flours can be used as a substitution to a bread flour? Will old corn meal ruin muffins?